So I’m finally done with moving. I had to skip a full week in SL to unpack and settle in. Which would normally be ok, but with all the events opening up in the first week of March I’m already way behind. But I’m gonna do my best to get as many posts out as possible in the upcoming weeks. First of, I wanna start with this gacha set from Sari-Sari. Being a big fan of their store, it’s always nice to see what new things they come up with. This Cafe Happy gacha is out at The Arcade and is as always super fun and very detailed. Seriously, the bread looks eatable! And don’t even get me started about the coffee. 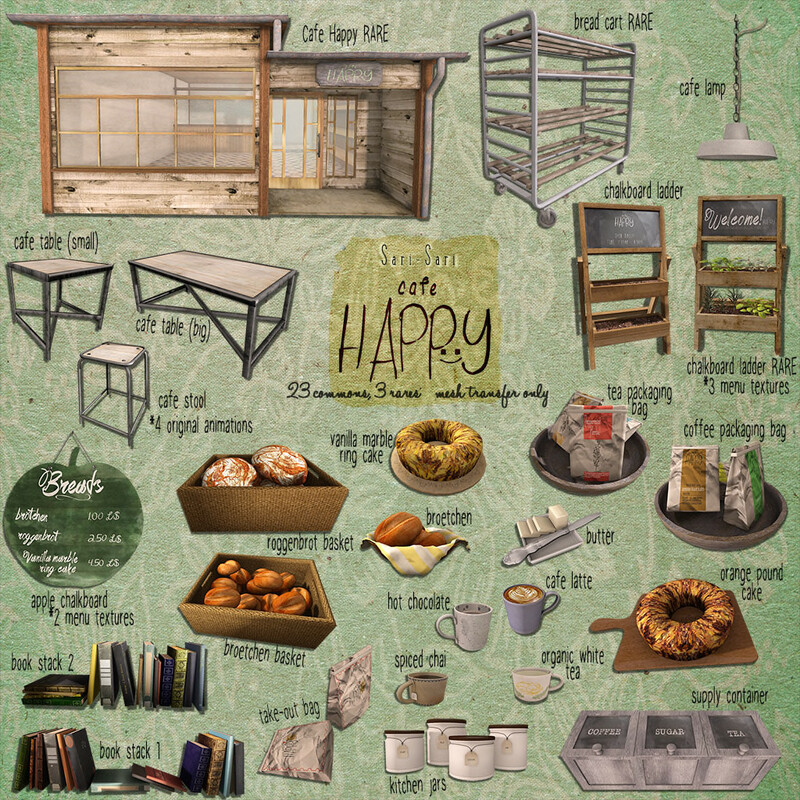 There are 21 items to win and 3 Rares, being the Cafe, the Chalkboard ladder and the Bread Cart. This is a super fun set to complete and put on your sim! I made a little collage of the separate items so it’s easier to see how they look. I also added the vendor add at the bottom. Go see for yourself how much fun this set is! So many new events opened up in January! I’m still enjoying the last days of my vacation, so I had some time left for some shopping. I’m completely in love with this bed by Trompe Loeil. It’s so romantic and the bed with the lights is so beautiful. It comes in a lit and an unlit version and it has multiple drape versions too. 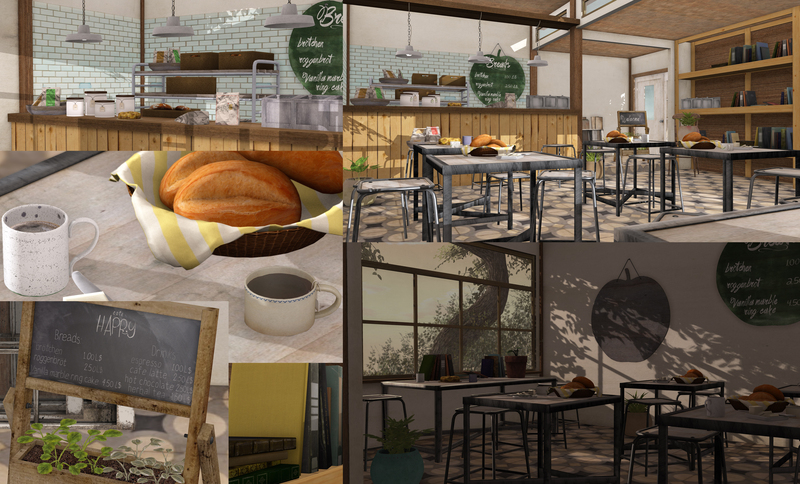 You can find this bed at Fameshed, which opened up on the first of this month. The beautiful Vanity Table and Stool is by [PM]PixelMode and I thought it would match perfectly with the scene I had in mind. You can find both at Uber along with these beautiful wine bottles and glasses set by Kunst. Us ladies know what to do with a good bottle of wine (or two)… Also, the super cute shelf behind me is by ATTIC and can be found at OneWord. Liv (the blond) is wearing the new Maitreya body, ‘Lara’. She also bought a lingerie applier from Zaara especially for the Maitreya body. I’m wearing the Belleza Venus body with the new set from Eudora which can be found at Uber. It’s a gorgeous corset which comes with a skirt and a top. The details on them are, like always, so beautiful. We’re both wearing a new hair release from Truth. It’s actually the same hair, Harmony, but it comes in a bun and a ponytail version. You can find that release at Truth’s mainstore. Hair: TRUTH – Harmony – Bun Version NEW!! Hair: TRUTH – Harmony – Ponytail Version NEW!! Back with more autumn goodies. It’s getting colder and colder, which means it’s almost time for winter wonderland pictures. But before it’s that time… Let’s enjoy this colorful season with these amazing new knits from Zenith! I’m totally in love with both. 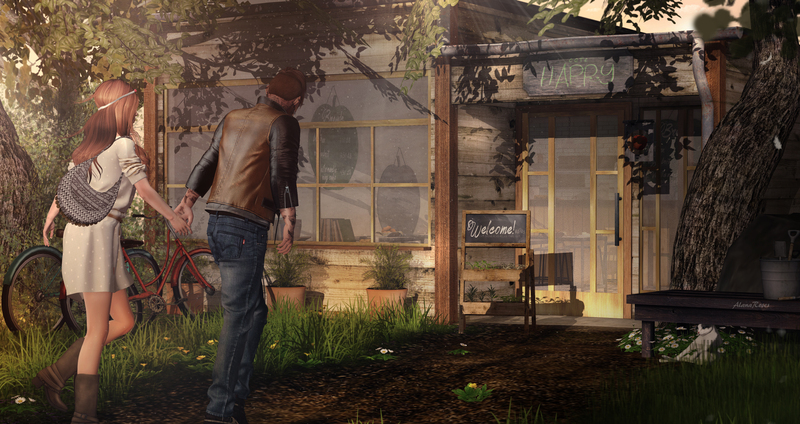 The sweater Liv is wearing can be found at Fameshed. And the knit dress I slipped on, is available at the new Kustom9 round which opened 2 days ago.